3D Print of Cytochrome MtrC in full-color sandstone. 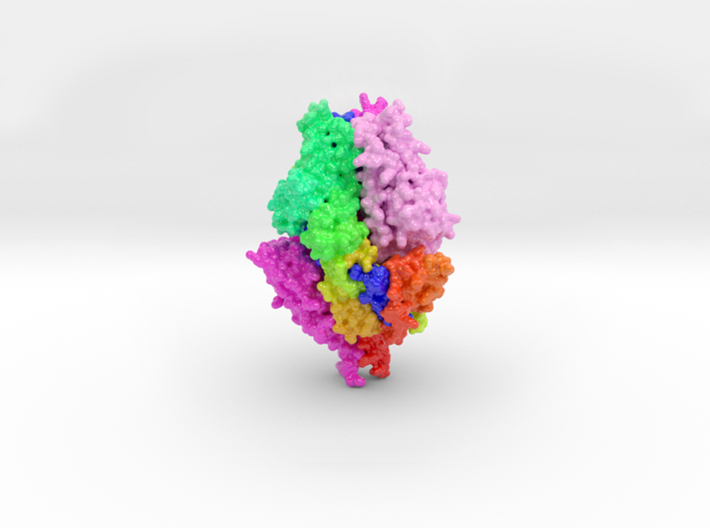 Model created from PDB ID 4LM8 and available in multiple sizes. Extracellular microbe-mineral electron transfer is a major driving force for the oxidation of organic carbon in many subsurface environments. Extracellular multi-heme cytochromes of the Shewenella genus play a major role in this process but the mechanism of electron exchange at the interface between cytochrome and acceptor is widely debated. The 1.8 Å x-ray crystal structure of the decaheme MtrC revealed a highly conserved CX8C disulfide that, when substituted for AX8A, severely compromised the ability of S. oneidensis to grow under aerobic conditions. Reductive cleavage of the disulfide in the presence of flavin mononucleotide (FMN) resulted in the reversible formation of a stable flavocytochrome. 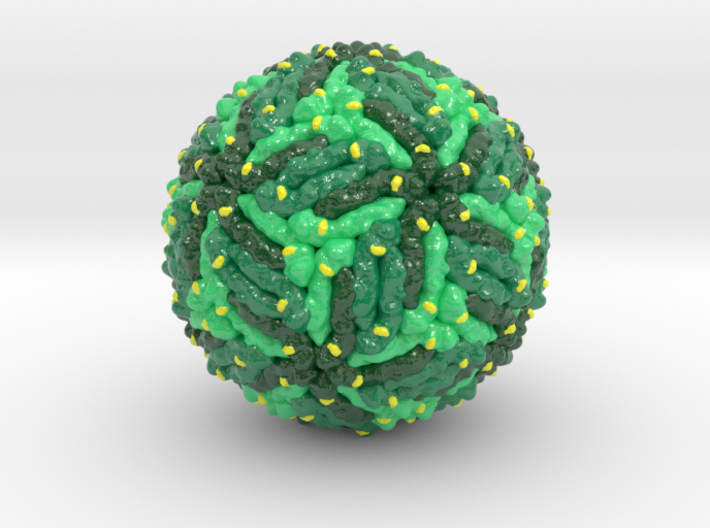 Similar results were also observed with other decaheme cytochromes, OmcA, MtrF and UndA. The data suggest that these decaheme cytochromes can transition between highly reactive flavocytochromes or less reactive cytochromes, and that this transition is controlled by a redox active disulfide that responds to the presence of oxygen. 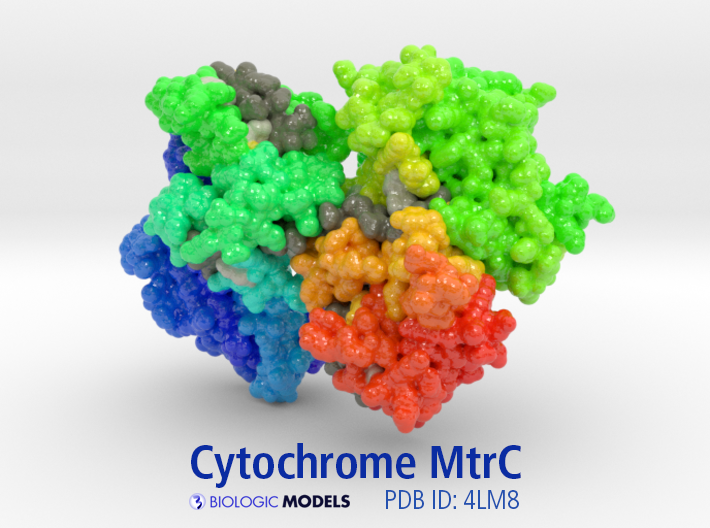 This is a 3D printed protein model of Cytochrome MtrC rainbow colored from N-terminal (blue) to C-terminal (red). To visualize the information discussed below, HEME Groups are colored dark grey, Cys residues controlling the protein’s conformation state colored yellow, HIS residues colored light grey. Model designed to match visualizations from Redox Linked Flavin Sites in Extracellular Decaheme Proteins Involved in Microbe-Mineral Electron Transfer.